I first tried the Clarins Instant Light Natural Lip Perfector (longest name ever) several years ago, back when they only had 3 colours to choose from! Since then the range has expanded - they now have a plethora of beautiful tinted shades, and years later this product is still one of my all-time faves. This range of lip loving products from Clarins are super moisturising and so easy to wear, perfect for keeping your lips nourished throughout Autumn. Whilst I love a bold lip, after dabbling with one too many liquid lipsticks my lips were feeling dry, dehydrated and in need of a bit of TLC. These products are the perfect solution to rescue your lips whilst still offering a lovely subtle tint of colour. First up is the original Natural Lip Perfector; whilst Clarins have introduced loads of new shades, including some limited edition beauts into the mix, I still gravitated toward number 01 - one of the original 3 shades! This is a subtle light pink shade which is just so neutral and easy to wear; it offers the prettiest pick-me-up to your lips, with the moisturising yet non-sticky formula providing a truly nourished and healthy gloss finish! I find myself reaching for this pretty much everyday, whether I want a neutral, glossy lip to finish off an evening full-face of makeup, or I'm having a no-makup makeup day - it is just ideal for any occasion! Finally, you can't rave about this product without mentioning the SMELL. Or is it the taste? Either way it has an unbelievably delicious, toasted marshmallow/candyfloss kinda flavour to it which is just soooo yummy and makes the product even more of a treat to use! Next up is the Lip Balm Perfector - this was my first time trying this product but I knew if it lived up to the rep of the Natural Lip Perfector it would be a winner for me. Luckily, it did! It is equally nourishing, so so easy to use and the perfect compact little package to pop in your bag for on the go. I chose shade 05 which is a gorgeous red tint, and a great kind-to-the-lips alternative to the classic red lip. This balm is perfect for when you don't want to commit to a full on, matte look, but still want a bit of colour. As with the gloss, the smell/taste of this product is just too blimmin' delish, and it's just such a great 2-in-1 balm/lipstick kinda product. If I'm feeling in a really multi-purpose kinda mood I even smudge a little on my cheeks for a healthy, rosy glow! As you can see from the swatches, the product can be lightly swiped on for a barely-there gloss, or built up more heavily to achieve a subtle colour pay off, making it all the more multi-functional and perfect for everyday wear. To wrap up this little post of Clarins appreciation, I thought I would mention this gorgeous complimentary gift I received - a selection of five iconic skincare products housed in this ethically sourced makeup bag, in association with charity FEED. The organisation looks to create products that engage people to support the fight against hunger - providing meals in the countries where their products are ethically produced. 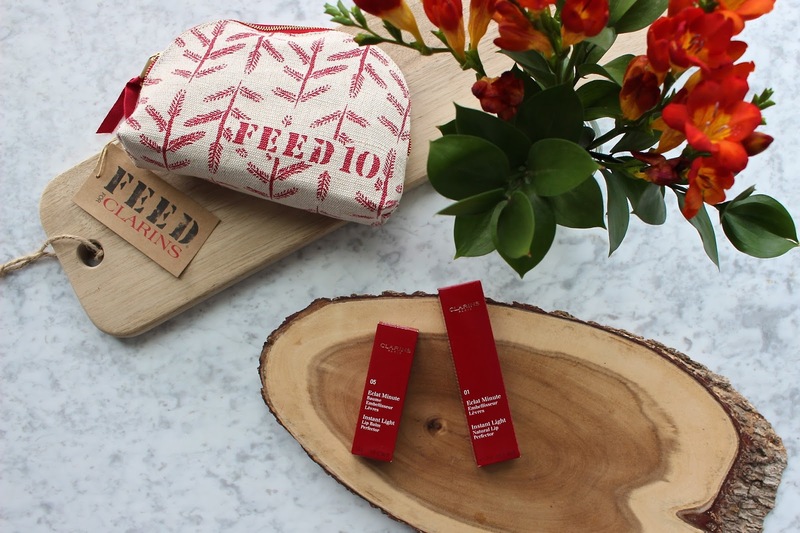 Not only is this package full of beaut nourishing goodness for the skin, but it is also in support of a fantastic cause - the Gift with a Purpose collaboration project - to date Clarins has provided over 10million meals through this initiative. The gift itself included some lovely bath and body bits which I am slowly working my way through, but one product that really stood out to me is the HydraQuench Cream Mask. This hydrating face masks definitely deserves a mention, as it has saved my skin in the recent chilly Autumn temps, - I simply use this as a face moisturiser for an extra boost of moisture when my skin is feeling ultra dehydrated - it works perfectly to revive and repair my dry and thirsty skin!